Aluminium Bahrain (Alba), a leading aluminium producer in the world, has announced it has signed a Service Level Agreement with APM Terminals Bahrain, operator of the kingdom’s Khalifa Bin Salman Port. 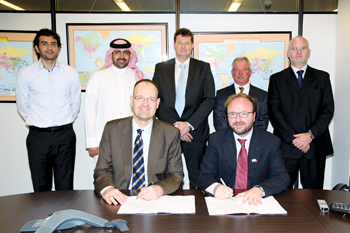 Signing the agreement were Alba’s adviser to the CEO, Jean-Baptiste Lucas, and Marco Neelsen, CEO of APM Terminals Bahrain. Present were Mark Hardiman, Bryan Webster and Yusif Sanad, representing the port operator, and Alba’s manager for sales Europe, Boris Santosi, and head of sales Europe, Hassan Habib. “The milestone agreement will boost Alba’s strategy to enlarge its presence in the global markets as well as enhance its overall service levels to customers. It will also reaffirm the good relations between the two companies and establish consistent and highly reliable logistics and services,” an Alba statement said. APM Terminals is headquartered in The Hague, Netherlands. The company’s core expertise covers design, construction, management and operation of ports, terminals and inland services.